Hey L.A. - walk in solidarity with the Trail of Dreams! Join us as we walk 18 miles in solidarity with the Trail of Dreams, a 1,500 mile journey from Florida to D.C. that 4 students began on January 1, 2010 for just and humane immigration reform and equal access to higher education. 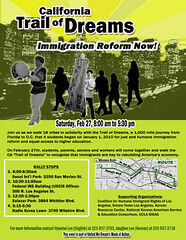 On February 27th, students, parents, seniors and workers will come together and walk the CA “Trail of Dreams” in Los Angeles to recognize that immigrants are key to rebuilding America’s economy. The solidarity walk in Los Angeles will be making a few stops throughout the city, you can join up at any of these locations on February 27th. The walk is part of the United We Dream Coalition's week of action. To find out more, visit KRCLA's site.